As far as dangerous beasts go, New Zealand is probably the safest place on earth! While other countries can boast of super venomous snakes, small fish with razor-sharp teeth, or horrible parasites that dig through your skin we can only shuffle uncomfortably and mention our poisonous spider. Which killed at least one person. In the 1840s. Probably. And to make matters worse, New Zealand has just become twice as safe because it seems that there is only one species of the spider, not two as has been thought. The katipo spider certainly looks the part. 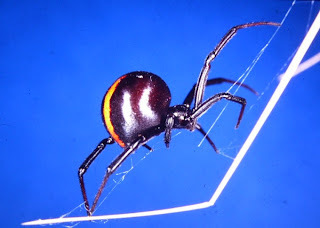 It is a glossy little spider and is part of the widow group, kin to the Australian Red Back and U.S. Black Widow. They are found living in vegetation and under driftwood of sandy dunes at beaches. Katipo found between Canterbury and Hawkes Bay/Taranaki have a red stripe running along the centre of their backs and known as Latrodectus katipo. Katipo from further north have no red and are known as Latrodectus atritus. Despite their fearsome reputation katipo are a threatened species with habitat modification, introduced dune grasses and introduced competitive spider species all combining to reduce numbers and distribution of katipo around New Zealand. A recent study by Adrian Paterson and Jagoba Malumbres-Olarte of Lincoln University in conjunction with spider experts Cor Vink (AgResearch) and Phil Sirvid (Te Papa Tongarewa- see the Te Papa blog for 10th February for more), published in Invertebrate Systematics, has shown that there is really only one species, with variable colouration. The researchers took samples from katipo populations around New Zealand and compared several molecular regions (COI, ITS1, ITS2) amongst the indivuals and also with samples from red backs and black widows. Katipo were very different from black widows but only a little different from red backs (in fact some red back DNA was found in a Bay of Plenty katipo indicating some previous interbreeding) and there were no consistant differences between L. katipo and L. atritus individuals. Physical structures were measured and compared between the species and, apart from the red stripe, there were no consistent differences. Next the researchers took males and females from around the country, turned down the mood lighting and watched to see what would happen. Nature took its course and mating occurred between L. katipo and L. atritus individuals quite happily. Egg sacs were produced and spiderlings hatched that survived until they were adults. So not only was the DNA of the two species similar but they could also interbreed. Strong evidence for only one species which will retain the name L. katipo. What about the red stripe? Why is that found in the south? The researchers found that the colour variation was clinal and was strongly associated with mean annual temperatures and as such the red stripe might be an environmental response.